This simple and easy lasagna recipe without ricotta cheese or cottage cheese is a basic cheese lasagna recipe without meat and without vegetables. Cooked lasagna noodles can be baked easily using deep lasagna pans. This simple lasagna recipe is perfect for beginners to learn how to make lasagna with minimal ingredients quickly and easily. Lasagna sheets are cooked first in boiling water following the package instructions, just like you do for regular pasta. And then we gather the sauce and cheese for adding in between the layers made of lasagna sheets. I used regular marinara sauce and a combination of shredded cheddar cheese and shredded mozzarella cheese, which was delicious and simple. You can try any other sauce as you wish, and try any cheese blends as you like. The amount of sauce and cheese in the recipe is what I used to bake the layers made of 18 sheets of lasagna. Adjust the amounts accordingly if you have more or less number of lasagna sheets. Also if you may slightly adjust the amounts of sauce and cheese as you desire. 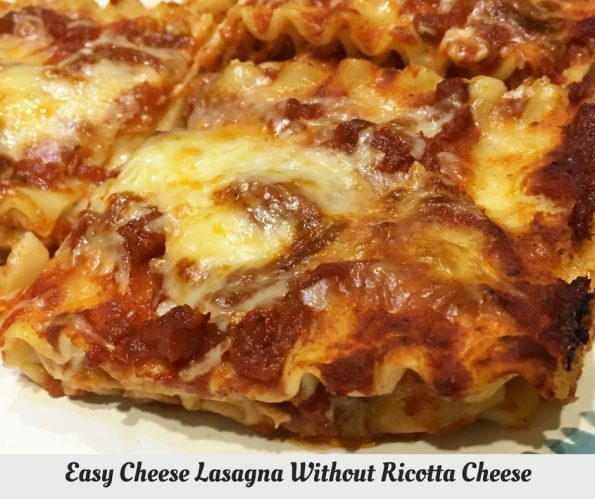 So here is how anyone can make this super simple lasagna following this simple and easy lasagna recipe without ricotta cheese or cottage cheese. Easy and simple cheese lasagna recipe for beginners, without using ricotta cheese or cottage cheese. Cook the lasagna sheets according to instructions in the package. Make sure to use enough water (boiling water) to cover the lasagna sheets, or it won't get cooked properly. After you put the sheets in to the boiling water, give it a minute so the sheets will become slightly soft and you can gently press with a spatula so the sheets will get immersed in the water. If there is no enough water, make sure to add more water. Once the lasagna sheets are cooked, drain the hot water and I recommend adding some cold water to the same pan, which will help you to easily transfer the lasagna sheet from the pan. Transfer the cooked sheets to a foil greased with little oil. Once the sheets are transferred to the foil or any flat surface, grease your palm with some olive oil and sprinkle some olive oil over the sheets and gently grease each sheet with olive oil, which will help to prevent the sheets from sticking together. Grease a large baking pan with oil(you may use a 13*9 inch baking pan or use any baking pan that can fit the sheets). Add few spoons of marinara sauce to spread over the baking pan. Add lasagna sheets on top of the sauce in a single layer. Add more sauce over the sheets and spread evenly. Add shredded cheese over the sauce in a single layer. 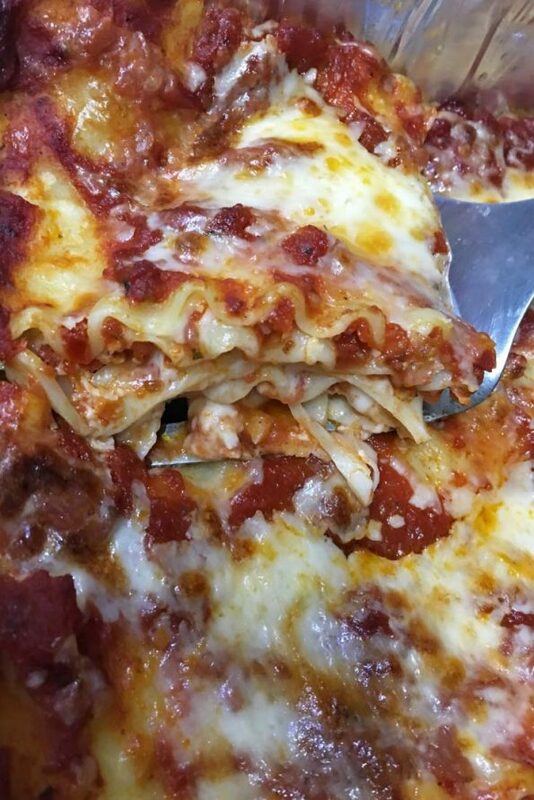 Place the next layer of lasagna sheets in a single layer. Again, repeat the process by adding a single layer of sauce which is topped with enough cheese in a single layer. Repeat this process until the top layer of lasagna sheets are placed (do not add cheese above the top layers now). Once the topmost layers are placed in a single layer, add enough sauce and spread the sauce evenly. Cover the baking pan with foil and bake in the preheated oven for about 20 minutes. After 20 minutes of baking, remove the covering foil and top the lasagna with shredded cheese as desired. Cover the baking pan again with foil and bake for another 10 more minutes. After 10 more minutes of baking, open the pan and see if the cheese is melted enough. You may keep the pan opened, and bake for another 5 more minutes, if needed so that the cheese will be bubbly and golden brown (do this only if you desire, you may also broil it for the final 3 to 4 minutes if you like). Allow the lasagna to cool down for few minutes, slice and serve! To make the slicing the serving easier, slice the lasagna in small squares starting from the end and lift the slices using a large spatula. I tried this easy lasagna recipe without ricotta cheese or cottage cheese as I didn’t have any ricotta or cottage cheese, and the lasagna turned out delicious with the mix of cheddar and mozzarella. 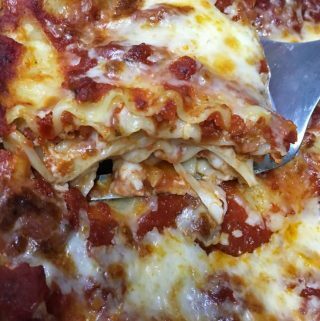 If you are using 18 lasagna sheets as called in this recipe, you may use 2 baking pans to bake the lasagna, using 9 sheets in each pan or you may use a single large pan to bake all the layers simultaneously (if you use a single pan, the layers will be little thick as there are many number of layers). 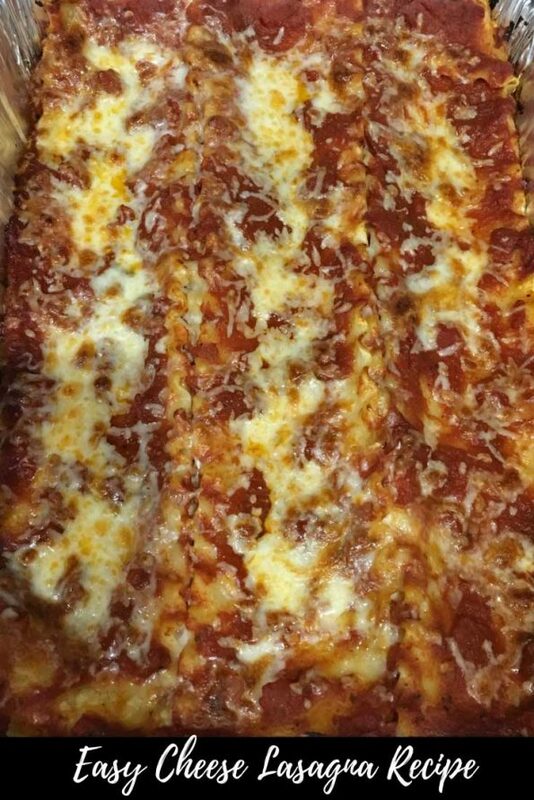 I used a single baking pan to bake all the lasagna sheets so I had 6 layers of lasagna with lasagna sheets in each layer. If you use two baking pans, you can have smaller number of 3 layers lasagna, so do it whichever way you like it. Make sure to use a large baking pan which can hold all layers and its fillings. A 9*13 inch baking pan can be used easily for making lasagna, you can also use disposable baking pans of this size (just like the one you see here) which ca hold all contents. Hope you found this post on cheese lasagna helpful in making easy and delicious cheese lasagna for lunch or dinner.